KIEV, Ukraine -- Ukrainian President Petro Poroshenko issued several decrees on Saturday to shut state institutions and banking services in pro-Russian eastern regions, pressing a move to cut links with the rebel-held territory. 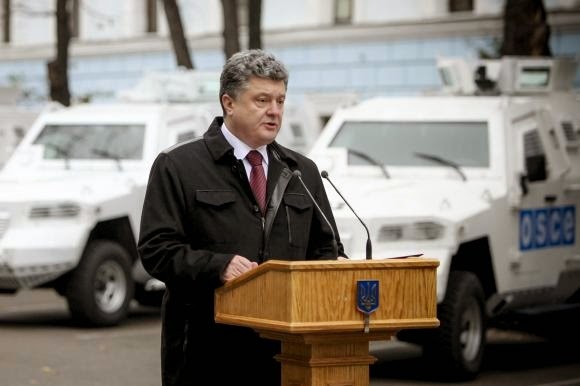 Ukrainian President Petro Poroshenko delivers a speech during a ceremony to hand over armoured vehicles KrAZ Cougar to the Organisation for Security and Cooperation in Europe's (OSCE), which will be used for monitoring the situation in eastern regions of Ukraine, near the Defence Ministry headquarters in Kiev November 13, 2014. A decree posted on the president's website said all state companies, institutions and organizations should end their work within a week and "evacuate workers, with their permission, (and) where possible remove property and documents". The ruling, which formally asks parliament to revoke the "special status" of the regions, also suggests Ukraine's central bank take measures to close down all banking services in certain parts of separatist-held areas, including card operations. A Reuters reporter saw an unidentified 40-vehicle column of military vehicles, including personnel carriers and artillery guns, traveling across separatist territory toward the rebel-held city of Luhansk on Saturday. A Ukrainian military spokesman said seven soldiers had been killed in the past 24 hours, while the press service for the 'Donetsk People's Republic' said six civilians, including two children, were killed in shelling on Friday. Ukraine is also facing an electricity crisis as the conflict has disrupted coal supplies to thermal power plants, which provide around 40 percent of the country's electricity, and has left reserves critically low ahead of the cold winter months.